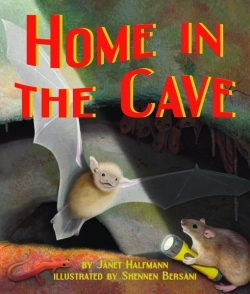 All things nocturnal and furry come alive in this unusual story of a baby bat learning about his surroundings. After a fall from his customary perch, and with Pluribus the rat as his guide, the little bat encounters all of the other critters—many are eyeless insects—that rely on bats for their survival. The baby bat welcomes his mother’s eventual return from foraging, but he also prizes his newfound independence. Fascinating scientific tidbits are made palatable and entertaining.